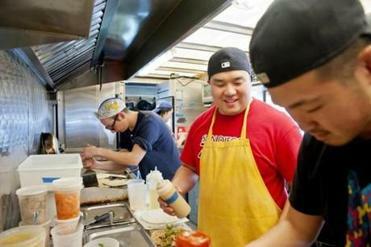 Find out what it takes to operate one mobile eatery serving contemporary Chinese-American cuisine. The Mei Mei team has served 10,000 of the menu favorite Double Awesome so far. ANDREW LI’S TWO SISTERS are as passionate about food as he is. He found that out through a blog they started. Margaret (Mei) was in San Francisco and then London, Irene was studying at Cornell, and the blog was their way of keeping in touch, sharing recipes, and talking about the food they were eating. Andrew, now 31, had worked in management at Legal Sea Foods and at Harvest in Cambridge and dreamed of starting his own business. It all coalesced late in 2011 when Mei and Irene (now 30 and 22, respectively) returned home to Brookline, where they’d all grown up, and the trio hit on the idea of launching a food truck. They knew they wanted to source everything locally and offer Bostonians contemporary Chinese-American cuisine they’d not tasted before. 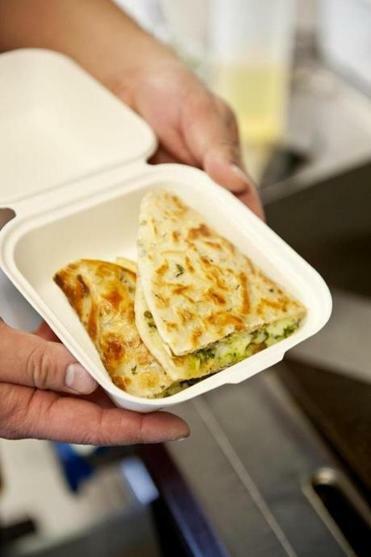 The Mei Mei (Mandarin for “little sister”) Street Kitchen truck hit the road in April 2012 with a changing menu that wowed customers. A dish called the Double Awesome (described later on in this article) quickly emerged as the Lis’ signature, but there are other mainstays, such as handmade fried dumplings served with sriracha fried rice and house pickles. Caramelized Onion Bread Pudding, inspired by a Thomas Keller recipe, is a “savory bomb” made from Clear Flour baguettes baked with onions, cheddar, cream, and eggs. Condiments are equally interesting: ginger slices, purple cabbage pickles, Rhode Island feta, seaweed strips, garlic panko. Even the hot cocoa rises to great heights. It’s enhanced with malted cranberry and barley syrup, garnished with house-made cayenne-flavored marshmallows, and topped with a trick of chemistry — powdered salted butter. If all this has your mouth watering, you’ll be happy to know the Mei Mei team will add a brick-and-mortar restaurant in Boston’s Audubon Circle in late spring or early summer. Meanwhile, the truck keeps rolling. Read on for a taste of a typical day. Mei Li takes orders while the crew cooks and assembles. The Mei Mei team has served 10,000 of this menu favorite so far. Read: First person: What’s happening to Boston’s Villa Mexico Cafe? Two people with cars meet at Gourmet Caterers (where Mei Mei has commissary and cooking space) in Roslindale. Get the truck ready to go. Load containers of prepped food, kitchen tools, rags, and aprons; fill water tank. Drive to Brookline Ice & Coal to get propane to fuel the grill, fryolator, and steam table (two or three times a week). Stop to gas up the truck (two or three times a week). 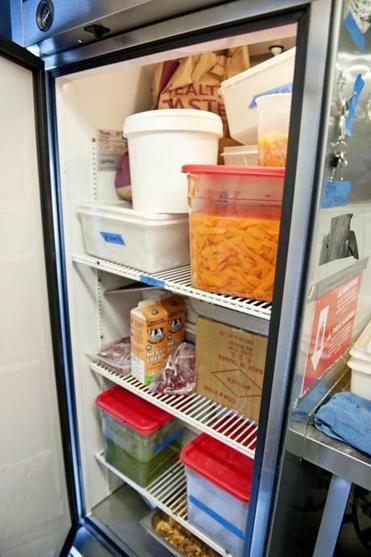 One of two refrigerators aboard holds herbs, veggies, garnishes, sauces, and other supplies. Three or more additional staff members meet at the truck, usually arriving by bicycle. The propane gets lit and the generator started. Containers come out of the fridge, a mound of steamed white rice is scooped over the hot grill, and sriracha sauce gets squirted all over it — turning the fried rice pink and steaming the whole cabin. Pancakes are par-fried and soups and rice porridge brought up to temp. The day’s menu (planned the week before) is handwritten in colorful chalk on boards. The staffer on social media duty starts tweeting via iPhone (@meimeifoodtruck) and posts the menu on tumblr (meimeiboston.tumblr.com). The large prop-up window is opened and staff start taking orders. 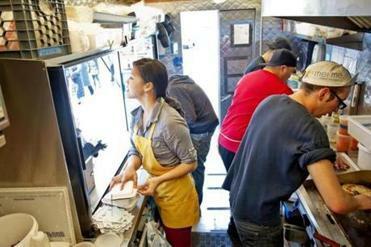 Lunch, for about 150 hungry customers per shift, is served five days a week. Four days a week there is also a dinner shift at a different locale. Andrew Li (in red shirt) mans the steam table. Head to dinner location and set up again. Dinner shift, typically serving about half as many people as at lunch. Meanwhile, at the Gourmet Caterers space three times a week, five to seven staffers meet to prep all the food for coming days. The only items not staff-made are scallion pancakes, sriracha sauce, ketchup, Clear Flour baguettes, and Chinese crullers. They make things like rice, sauces, soup (60 gallons at a time), and dumplings (200 at a time) from scratch. (The dumplings get pre-steamed; staffers will crisp them in the truck’s fryer before serving.) Sometimes the shift involves work that takes muscle, like breaking down a pig from John Crow Farm in Groton. After dinner service, the truck rolls back to Roslindale, where staffers unload its fridges, put waste in compost bins, empty steam tables, and clean the truck, top to bottom. 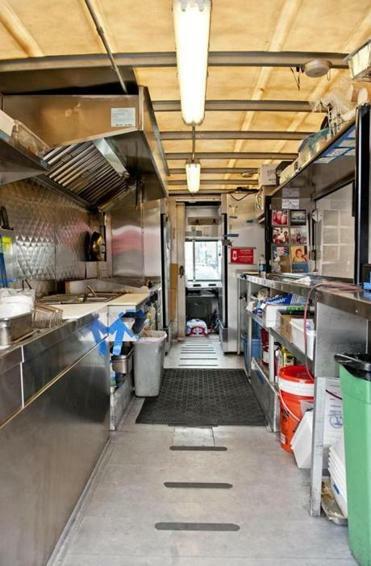 The inside of Mei Mei’s food truck. “Go out to eat!” exclaims Irene, who has dinner with boyfriend Max Hull (he’s also Mei Mei’s butcher) two or three times a week. Once a month the whole staff might eat together, but they also love going out with friends from the industry. Journeyman in Somerville is a favorite spot, as is The Gallows in the South End. The kitchen has an 8-by-16-foot working space and took four months to customize. Five to seven people skillfully navigate the 4-foot-wide floor. Brown a scallion pancake on both sides. Slather one-half with fresh pesto, sprinkle the other with grated cheddar, then crack two eggs — they’ve already been poached inside their shells using an immersion circulator — onto the grill. 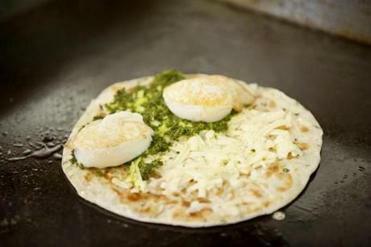 Place lightly crisped eggs atop the pesto (crunchy bacon strips optional). Fold, cut in half, and serve with spicy ketchup. Rachel Travers is a writer in Lincoln. Send comments to racheltravers.food@gmail.com.